The Range Rover L560 shares the rounded hood and long coupelike form of the Jaguar F-Pace. A new Range Rover -- bigger than the Evoque and with coupe styling -- is taking shape at Land Rover. Recent spy photographs taken in Scotland show a longer version of the Range Rover Evoque code-named L560. 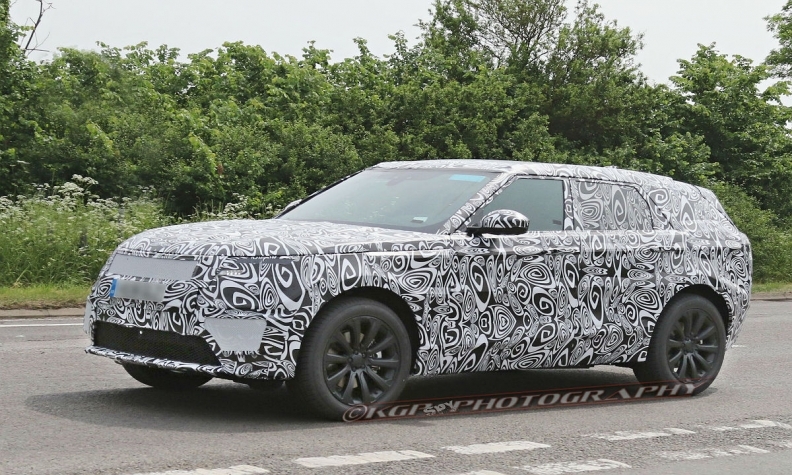 Body cladding on the Range Rover mule appears to be concealing a coupelike rear end. It would fall below the Range Rover Sport and could be called the Range Rover Sport Coupe. Internally, the vehicle is referred to as Evoque Plus. Design cues from one of Land Rover’s corporate siblings, the Jaguar F-Pace, which is based on the aluminum-intensive architecture underlying the XF and XE sedans, can also be seen in the photos. The new Range Rover will be based on the same architecture as the F-Pace. Land Rover is following BMW and Mercedes-Benz in marketing sporty crossovers. Land Rover has incorporated a lower ride and wider stance like those of the BMW X6 and Mercedes-Benz GLE Coupe. Media reports say the vehicle will have a sporty, tarmac-focused configuration with little regard for off-road prowess. The cabin is expected to be more intimate -- resembling a cockpit -- than current Range Rovers’ cabins.